Tom Moseley explains to The Football Front his thoughts on Mancini and his tactics this season. 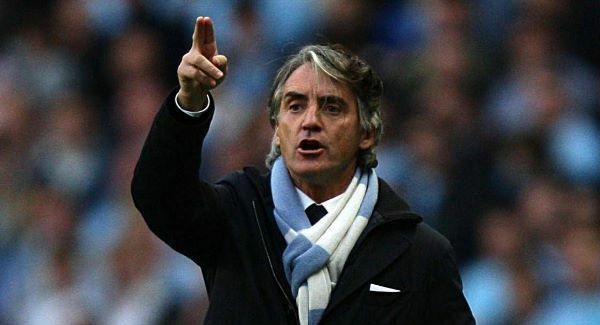 Lately, there has been lots of talk and debate about Manchester City and their plethora of different tactics, with Roberto Mancini being the centre of the discussion, there’s been differing views and Mancini has defended himself in the press, while indirectly insulting his players. People are saying he changes formation too often, he rotates too much and that he’s a perfectionist, but nothing can be perfect, so even in times of elation and great performances he will say something can be improved – he has been labelled as a ‘tinkerer’ by some, rather than a good tactician, which would have been the standard compliment for him last year, but I always thought the change of tactics and systems was a good thing, giving them versatility, but many disagree. He went on to say that the comments weren’t about Micah Richards, but it does make you think, as it reminds me of Arrigo Sacchi. Sacchi said he wanted players who could not only play football, but they understood football and the football he wanted them to play, players with a good understanding of the game as well as ability, he says this is why his Milan side were so successful, because they shared the same idea on how the football should be played. If Mancini doesn’t have this, and the players don’t understand the systems, or share the same ideas, will this hinder Manchester Citys progress? At least in the short-term where he can’t bring in his own players who are tactically astute enough for his liking? Possibly. But, that’s beyond the point, are Manchester City struggling in Europe because of tactical inconsistency, or is their tactical versatility a strength, which is just being used as a scapegoat when things go badly in Europe? Mancini certainly believes it’s the latter, after he said they conceded the third goal against Ajax due to a silly mistake, not a change in tactics. They’ve also been changing their tactics in the Premier League, depending on the opposition and situation, and it’s worked successfully,. so why would it be so drastically different in Europe? The only time it could be different in Europe is in the case of Manchester United, I think. Manchester United always attack, and until recently have played with two wingers, and the full backs have also got forward meaning the defence can be left a bit exposed, they also usually maintain (again, until recently) a 4-4-2 formation, which can work extremely well, but last year in Europe it didn’t. Their attacking style of play, and width, left them open at the back and teams who were tactically organized better than them would get the win, look at Atheltic Bilbaos infamous 3-2 win at Old Trafford, masterminded by the great Marcelo Bielsa. However, with City, they are quite a defensive, and tactically organized team who have been built with an extremely strong defence and spine, suiting a Continental style. In the Premier League, they started with the three at the back formation against Liverpool, and reverted to it in the last-gasp win against West Brom at the Hawthorns, both away games in which they got four points out a possible six, both tough places to visit plus they had ten men for the majority of the game against West Brom. So, the ‘tactical tinkering’ worked wonders against West Brom, setting up waiting for the chance to counter, inviting West Brom onto them before pouncing and Edin Dzeko finishing off an incisive counter attack, so why isn’t this mentioned when people talk about the change of tactics? Or, how they lined up with the three at the back formation against Chelsea in the Community Shield and won? It’s also the same system they used in the FA Cup game against Manchester United, after Belgian centre-back and club captain Vincent Kompany got an early red card for a two-footed challenge, where City managed to pull two goals back and give Manchester United a real scare, who thought they’d finished the game when they went 3-0 up in the First half. So, why hasn’t this form carried on into Europe? I’m not sure, but what if the other teams were just better than Manchester City? City are an extremely strong side, no one can beg to differ, and with the heavy investments that’s what you expect, but they’ve come up against three good sides, all champions in their own countries as well, so it’s not a complete shock they haven’t won yet. The media seem to make out that City have been awful and should be strolling every game, but let’s not forget who they’re playing. Spanish Champions, record European Cup holder, winning it on nine occasions: Real Madrid, and to make it even harder, at the Bernabeu, which is a fortress. I can’t remember many teams winning there apart from Barcelona, it’s quite rare if a team draws there, Real Madrid are one of the best sides ever, so is it really shocking that they lost? No. I think, more than anything, it was the manner of the loss that annoyed Mancini most, and made the media get on their backs. Then, Borussia Dortmund, it may have been at the Etihad, but Jurgen Klopp has assembled a young side, that is not only great technically, they’re all extremely energetic and will work and close down, making it hard for the opposition to play. A draw is a bad result for Manchester City at home, but disastrous? Not really, Dortmund are a quality side and they are still wanting to prove themselves against the best in the world, which will give them that extra fight and make them go the extra mile, not to mention Klopps tactical mind, as they also went on to beat Real Madrid 2-1 at the Signal Iduna Park thanks to a Klopp tactical masterclass. Now, the Ajax game they probably should have won, but I think if you had to put this down to something, it would be the mentality of the players. Ajax are a young side, with the majority coming through the youth ranks at the club, and with the Eredivise being a relatively small league and not getting as much coverage as it should, they would want to go out and prove themselves against the world’s best clubs on a bigger stage, and there aren’t many better ways to do it than beating the Champions of England, the place many people call the birthplace or home of football. So, they would want to really show the world what they can do, plus with all the ‘Say No To Modern Football’ protests in the crowd, you don’t know if that attitude is transcended onto the pitch and the players share a similar mind-set, and they want to prove it’s not all about money and billionaire investors, it’s a about the football. I think you also shouldn’t underestimate Ajax’s quality, with their famous youth academy, all the players who make it through have an amazing technical ability, as well as being versatile due to not having set positions, being they can do most things and are incredibly well-rounded, and just because they play in a smaller league and they don’t splash a load of money on players, people tend to forgot the raw quality of the players. So, overall, do Manchester City have tactical versatility, or is their constant change on tactics the reason why they can’t take the league form into Europe? I personally think it’s the former, they’re tactical versatility is a huge asset in my eyes. When a Manchester City line-up is announced, you’re still not 100% sure how it will be set out, which gives them a bit of unpredictability and keeps the opponent guessing, meaning the opposing manager could prepare for one thing, see the line-up and think he’s right, but then also because of the versatility of the players, they’re completely wrong meaning there will have to be some last minute improvisation that could upset the rhythm of their team. Then, the changes of tactics is working in the league, but nothing is said about that, which gives you the impression that the tactical inconsistency reason for Citys below-par performances on the Continent, is just another scapegoat by the media, following on from last year’s lack of experience scapegoat. Manchester City have a huge asset and advantage with their ability to change systems mid-game in certain situations, and has worked well for them, but one question that still remains is – Why can’t they carry on their League form into Europe?